عندلیب اردکانی, داوود, کشاورز, پریسا. (1395). بررسی توسعه محصول سبز و تأثیر آن بر تصویر ذهنی مشتریان با رویکرد مدل سازی معادلات ساختاری (مطالعه موردی:صنایع مواد غذایی استان یزد). 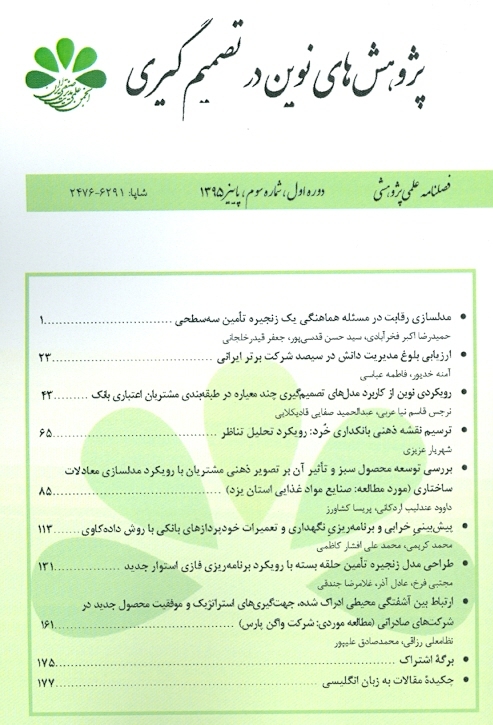 پژوهش های نوین در تصمیم گیری, 1(3), 85-112. داوود عندلیب اردکانی; پریسا کشاورز. "بررسی توسعه محصول سبز و تأثیر آن بر تصویر ذهنی مشتریان با رویکرد مدل سازی معادلات ساختاری (مطالعه موردی:صنایع مواد غذایی استان یزد)". پژوهش های نوین در تصمیم گیری, 1, 3, 1395, 85-112. عندلیب اردکانی, داوود, کشاورز, پریسا. (1395). 'بررسی توسعه محصول سبز و تأثیر آن بر تصویر ذهنی مشتریان با رویکرد مدل سازی معادلات ساختاری (مطالعه موردی:صنایع مواد غذایی استان یزد)', پژوهش های نوین در تصمیم گیری, 1(3), pp. 85-112. عندلیب اردکانی, داوود, کشاورز, پریسا. بررسی توسعه محصول سبز و تأثیر آن بر تصویر ذهنی مشتریان با رویکرد مدل سازی معادلات ساختاری (مطالعه موردی:صنایع مواد غذایی استان یزد). پژوهش های نوین در تصمیم گیری, 1395; 1(3): 85-112. از زمان ایجاد انقلاب صنعتی تا کنون، انواع محصولاتی که تناسب چندانی با محیط زیست ندارند و روش‌هایی که به این محیط آسیب وارد می‌کنند، از نظر مصرف کنندگان و دوست‌داران محیط زیست مورد توجه قرار گرفته است. این امر باعث توجه شدید شرکت ها به مفهوم توسعه محصول سبز شده است. از طرفی، از آنجا که تصویر شرکت در ذهن مشتری یکی از مزیت های رقابتی برای شرکت است، شرکت ها به ایجاد تصویر مثبت از خود در ذهن ذی نفعان خود می‌پردازند. پژوهش حاضر، باهدف بررسی تأثیر توسعه محصول سبز بر تصویر ذهنی مشتریان انجام شده است .جهت نیل به این هدف پس از بررسی ادبیات هر کدام از این متغیرها، یک مدل مفهومی با شش فرضیه پیشنهاد شد که این فرضیات بر روی شرکت‌های فعال در صنایع مواد غذایی استان یزد و با استفاده از رویکرد مدلسازی معادلات ساختاری بر پایۀ روش کمترین مربعات جزئی مورد آزمون قرار گرفتند. نتایج این پژوهش نشان داد که توسعه محصول سبز به صورت مستقیم بر هویت سازمان تأثیر گذار است و به صورت غیر مستقیم از طریق متغیرهای میانجی هویت سازمانی بر کیفیت خدمات تأثیر گذار می‌باشد و از طریق متغیر های میانجی هویت سازمانی، کیفیت محصولات و رضایتمندی مشتریان بر تصویر ذهنی مشتریان تأثیر دارد. درنهایت بر پایه اثر کلی توسعه محصول سبز بر تصویر ذهنی مشتریان، پیشنهادهای کاربردی برای پیاده‌سازی اقدامات مرتبط با توسعه محصول سبز، بهبود کیفیت محصولات، بهبود تصویر ذهنی شرکت در ذهن مشتریان ارائه گردیده است. Since the Industrial Revolution environmental, variety of products that don’t fit with the environment and the ways in which harm the environment are taken into consideration of consumers and lovers of the environment. It causes company’s intense attention now to the concept of green product development. On the other hand, since the company's image in the minds of customers is a competitive advantage for them, companies try to create a positive image of themselves in the minds of their stakeholders. The present study aimed to investigate the impact of green product development on the customer image. To achieve this goal, after studding the literature review of each of these variables, a conceptual model with six hypotheses was proposed. Then these assumptions were tested on active companies in the food industry in Yazd province by using structural equation modeling approach based on the R SQUAR. The results of this study showed that green product development directly effects on the organization's and also Green product development indirectly effect on the customers mental image through the organization's identity, production quality and customer’s satisfaction finally according to the total results of the green product development on the mental image, some functional suggestions to implement GPD, service quality and improve customer mental image are offered. ung W., Chan H., So J., Wong D., Choi A., Yue T. (2011)" A life-cycle assessment for eco redesign of a consumer electronic product", Journal of Engineering Design, 22(2): 69-85. Tondkar H. (1387) "Green marketing: Marketing future generation", Third International Conference on Marketing Management, p. 4. Porter M. E., Van der Linde C. (1995) "Toward a new conception of the environment competitiveness relationship", J. Econ. Perspect, 9 (4): 97e118. Jabbour A.B.L.S., Jabbour C.J.C., Sarkis J., Govindan K. (2014) "Brazil's new national policy an solid waste: Challenges and opportunities", Clean Techno, Environ, Policy 16 (1): 7e9. Geng Y., Fu J., Sarkis J., Xue B. (2012) Towards a national circular economy indicator system in China: An evaluation and critical analysis", J. Clean, Prod. 23 (1): 216e224. Borchardt M., Wendt M.H., Pereira G.M., Sellitto M.A. (2011) "Redesign of a component based on ecodesign practices: environmental impact and cost reduction achievements", J. Clean. Prod, 19 (1): 49e57. Albino V., Balice A., Dangelico R.M. (2009) "Environmental strategies and green product development: An overview on sustainability-driven companies", Bus.Strategy Environ, 18 (2): 83e96. Pujari D., Peattie K., Wrigh G. (2004) "Organizational antecedents of environmental responsiveness in industrial new product development", Ind. Mark. Manag, 33(5): 381e391. Driessen P.H., Hillebrand B., Kok R.A., Verhallen T.M. (2013) "Green new product development: the pivotal role of product greenness", IEEE Trans. Eng. Manag, 60(2), 315e326. Mostafa M. M. (2009) "Shades of green: A psychographic segmentation of the green consumer in Kuwait using self-organizing maps", Expert Systems with Applications, (36): 11030 –11038. Suplico L. T. (2009) "Impact of green marketing on the students purchase decision", Journal of International Business Research, 8 (2): 71-81. Kotler P., Armstrong G., Wong V., Saunders J. (2008) "Marketing defined", Principles of Marketing, 7. Borhani Leila, Noori Abolghasem, Molavi Hosein, Samavatian Hussein (1393) “Study the relationship between the organization's image, brand image, service quality and customer satisfaction to customer loyalty in banking industry", Journal of cognitive and behavioral sciences studies the fourth year, No.1, Vol. 6, pp. 115-130. Egblopeali A. Y., Aimin W. (2011) "Reoseurly on effects of corporate image, customer satisfaction and switching cost on customer loyalty in togolese telecommunication companies", Roceedings of the 7th International Conference on Innovation & Management. Noori Iraj, Fattahi Komeil. (1390) "Measuring customer satisfaction in Sadwrat Tosea Bank of Iran by using the satisfaction multi analysis", Journal of Management research in Iran, No. 15, (2), 205-229. Brodie R. J., Whittome J. R. M., Brush G. J. (2009) "Investigating the service brand: A customer value perspective", J. Bus. Res., 62, (3): 345-355. Flavian C., Torres E., Guinaliu M. (2004) "Corporate image measurement: A further problem for the tangibilization of Internet banking services", International Journal of Bank Marketing, 22(5): 366-384. Chattananon A., Lawley M., Trimetsoontrorn J., Supparerkchaisakul S., eelayouthayothin L. (2007) "Building corporate image through societal marketing programs", Society and Business Review, Vol. 2., No 3. Pp. 230-253. Baskin O. W., Aronoff C. E. (1988) "Public relations: The profession and the practice", New York: IA: Wm. C. Brown Publishers. Bonner C. (1997) "Image is all: Deregulation, restructuring and reputation in the natural gas industry", American Gas, 79 (8): 38-39. Amirshahi M., Yazdani H. Alipour, (1392) "Assesmenting the effect of green marketing tools on the consumer behavior of social networks in Iran", The Journal of new Marketing Research, 4 (11): 41-58, (In Persian). Lü Y. L., Geng J., He G. Z. (2015) "Industrial transformation and green production to reduce environmental emissions: Taking cement industry as a case, Advances in Climate Change Research, 6(3): 202-209. Sergio Silva Braga Juniora, Dirceu da Silvab , Marcelo Luiz D. S. Gabrielb, Waleska Reali de Oliveira Braga (2015)" The effects of environmental concern on purchase of green products in retail", Procedia - Social and Behavioral Sciences, (170): 99 – 108. Peattie K., Crane A. (2005) "Green marketing: legend, myth, farce or prophesy? ", Qualitative Market Research, 8 (4): 357-370. Jasti N. V. K., Sharma A., Karinka S. (2015) "Development of a framework for green product development", Benchmarking: An International Journal, 22(3): 426-445. Rosa Maria Dangelico, Pierpaolo Pontrandolfo (2009) "From green product definitions and classifications to the Green Option Matrix", Journal of Cleaner Production, pp. 1608-1628. Norm Borin, Douglas C., Cerf Krishnan R. (2011) "Consumer effects of environmental impact in product labeling", Journal of Consumer Marketing, 28: 76–86. Boks C., McAloone T. C. (2009) "Transitions in sustainable product design research", International Journal of Product Development, 9(4): 429-449. Johansson G., Sundin E. (2014) "Lean and green product development: two sides of the same coin? ", Journal of Cleaner Production, 85: 104-121. Gupta S., Pirsch J. (2008) " The influence of are tailer’s corporate social responsibility program on reconceptualizing store image", Journal of Retailing and Consumer Services, 15 (6): 516–526. Wang C.-Y. (2010) "Service quality perceived value corporate image and customer loyalty in the context of varying levels of switching costs", Psychology and Marketing, 27: 252-262. Helgesen Ø., Håvold J. I., Nesset E. (2010) "Impacts of store and chain images on the “quality–satisfaction–loyalty process” in petrol retailing", Journal of Retailing and Consumer Services, 17(2): 109-118. Barich H., Kotler P. (1991) "A framework for marketing image management", Sloan Management Review, 32: 94-104. Hu H.H.S., Kandampully J., Juwaheer T.D. (2009) "Relationships and impacts of service quality perceived value customer satisfaction and image: An empirical study", The Service Industries Journal, 29: 111-125. Edvardsson B. (2005) "Service quality: Beyond cognitive assessment", Managing Service Quality: An International Journal, 15(2): 127-131. Hansemark O. C., Albinsson M. (2004) "Customer satisfaction and retention: the experiences of individual employees", Managing Service Quality: An International Journal, 14(1): 40-57. R. Souiden, N., Ladhari I. (2011) "Determinants of loyalty and recommendation: the role of perceived service quality emotional satisfaction and image", Journal of Financial Services Marketing, 16: 111-124. Cheng T., Lai L., Yeung A. (2008) "The driving forces of customer loyalty: a study of internet service providers in Hong Kong", International Journal of E-business Research, 4: 26-42. Ostrowski P.L., O'Brien T.V., Gordon G. L. (1993) "Service quality and customer loyalty in the commercial airline industry". J, Travel Res. Johnson M.D., Gustafsson A., Andreassen T.W., Lervik L., Cha, J. (2001) "The evolution and future of national customer satisfaction index models", Journal of Economic Psychology, 22: 217- 45. LeBlanc G., Nguyen N. (1996) "Cues used by customers evaluating corporate image in service Industry Management", Vol. 7, No. 2. pp. 44-56. Moghadami M., Zare M (1387) “Study the customer’s mental image of organization and it’s improve mental ways”, Third international marketing conference, studding the place of green marketing in consumer purchasing behavior", Organizational Culture Management, 2: 89-102. Kazoleas D., Kim Y., Anne Moffitt M. (2001) "Institutional image: a case study", Corporate communications: An International Journal, 6(4): 205-216. Menck A., Filho J. (2014) "Green marketing and corporate social engagement as strategy tools-a conceptual framework", International Journal of Humanities and Social Science, 2 (5):1-11. Chen Y.S., Chang C.H (2013a) "Enhance environmental commitments and green intangible assets toward green competitive advantages: An analysis of structural equation modeling (SEM)", Qual. Quant, 47(1): 529–543. Ghadikallaei A., Tabibi M., Haji Abadi F. (1392) Combination approach of fuzzy DEMATEL-ANP to Prioritize green supplier performance evaluation criterias", Journal of Management research in Iran, No. 17, (3):129-149. Horiuchi R., Schuchard R (2009) "Understanding and preventing greenwash: A business guide", Futerra Sustainability Communications, London. D'souza Clare, Taghian Mehdi, Lamb Peter (2006) "An empirical study on the influence of environment labels on consumers", An InternationalJournal ofCorporate Communications, Vol. 11, No. 2, pp.162-173. Bahrami, M. Mirjalili, Hashemnia SH., Ranjbar Ezatabadi M., Ahmadi tehrani Q (1392) "Comparison study of brand image of public and private hospitals in Yazd in the customer’s minds", Medicine and cultivation, 22(4)": 9-16. Balmer J. M. (2008) "Identity based views of the corporation: insightsfrom corporate identity, organisational identity, social identity, visual identity, corporate brand identity and corporate image", Eur. J. Market, 42 (9): 879-906. Fuller J., Marler L., Hester K., Frey L., Relyea C. (2006) "Construed external image and organizational identification: A test of the moderating influence of need for self- steem", The Journal of Social Psychology, Vol. 146, No. 6, pp. 701-716. Zairi M. (2000) "Managing customer satisfaction: A best practice perspective", The TQM Magazine, 11 (6): 389-394 . Lee J. H., Kim H. D., Ko Y. J., Sagas M. (2011) "The influence of service quality on satisfaction and intention: A gender segmentation strategy", Sport Management Review, 14(1): 54-63. Kheng L. L., Mahamad O., Ramayah T., Mosahab R. (2010) "The impact on service quality on customer loyalty: A study of banks in penang, Malaysia", International Journal of Marketing Studies, 2 (2): 57 – 66. Allame S., Noktedan A (1389) "Studying the effect of service quality on customer loyalty (Case Study: four and five star hotels in Isfahan)", Marketing Management, Fifth Year, No. 4, pp.109-124. Parasuraman A., Ziethaml V.A., Berry L.L. (1988) "SERVQUAL: A multiple- item scale for measuring consumer perceptions of service quality", Journal of Retailing, 64 (1): 12-40. Erdem T., Swait J. (2004) "Brand credibility, brand consideration and choice", J. Consum. Res., (31): 191–198. Teas K., Agarwal S. (2000) "The effects of extrinsic product cues on consumers' perceptions of quality, sacrifice and value", Journal of the Acad. Mark. Sci., 28 (2): 278-290. Kuo Y. F., Wu C. M., Deng W. J. (2009) "The relationships among service quality, perceived value, customer satisfaction, and post-purchase intention in mobile value-added services", Computers in Human Behavior, 25(4): 887-896. Clottey A., Toyin C. A., Stodnick M. (2008) "Drivers of customer loyalty in a retail store environment", Journal of Service Science, 1 (1): 252-265. Heidarzadeh Hanzaee K., Torabi Farsani F. (2011) "The effects of brand image and perceived public relation on customer loyalty", World AppliedSciences Journal, 13, (2): 277-286. Beerli A., Martin J. D., Quintana A. (2004) "A model of customer loyalty in the retail banking market", European Journal of Marketing, 38 (1): 253-275. Chen S. C. (2012) "The customer satisfaction–loyalty relation in an interactive e-service setting: The mediators", Journal of Retailing and Consumer Services, 19(2): 202-210. Bloemer J., Ruyter K., Peeters P. (1998) "Investigating drivers of bank loyalty: The complex relationship between image, service quality and satisfaction", International Journal of Bank Marketing, 16, (7): 276-286. Soonthensmai Vuttichat (2001) "Predicting intention and behavior to purchase environmentally sound or green products among thai consumers: An application of the theory of reasoned action", The Wayne Huizenga Graduate School of Business and Entrepreneurship, Nova Southeastern University, DBA, pp. 1-264. Lee K. (2009) "Gender differences in Hong Kong adolescent consumers' green purchasing behavior", Journal of Consumer Marketing, 26(2): 87-96. D’Souza C., Taghian M. (2005) "Green advertising effects on attitude and choice of advertising themes", Asia Pacific Journal of Marketing and Logistics, 17 (3) : 51-66. Ramezanian M., Ismaeilpoor R., Tondkar S (1389) "Assesmenting of the Effect of green marketing mix elements on purchasing behavior of CFLs consumers in Rasht".No. 5, pp. 79-89. Chang N.-J., Fong C.-M. (2010) "Green product quality , green corporate image, green customer satisfaction, and green customer loyalty", African Journal of Business Management , 4 (13): 2836-2844. Ottman J. A. (1992) Green Marketing, NTC Business Books, Chicago, USA. Khandoker M., Mahbubu H. (2011) "Exploring price sensitivity of a green brand: A consumers’ perspective", World Review of Business Research, 1(2): 84 – 97. Chen Y. S., Chang C. H. (2012) "Enhance green purchase intentions: The roles of green perceived value, green perceived risk, and green trust", Management Decision, 50(3): 502-520. Mourad M., Serag Y. Eldin A. (2012) "Perception of green brand in an emerging innovative market", European Journal of Innovation Management, 15 (4): 514-537. Haenlein M., Kaplan A. M. (2004) "A beginner's guide to partial least squares analysis, Understanding Statistics, 3(4): 283-297.